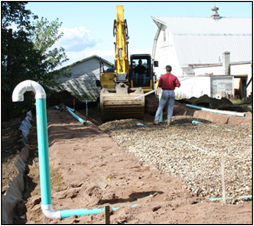 Karl's Site Work has been installing Septic Systems for over 55 years. We have a broad range of experience with all types of systems from drywells, leach galleys, tight tanks, pressure systems to raised systems and infiltrator systems. We are certified to install the Presby Systems and Geo-Flow as well. Our full line of equipment includes mid sized tracked and rubber tired excavators that can replace your septic system with minimal site disruption. We have 2 sand pits with Title V sand as well as screened loam to install over your completed system. Our knowledgeable staff will guide you through the entire process. Contact us for installation information. Selling a house? Refinancing? You'll need a Title V inspection of your Septic System. We provide full Title V service-uncovering, locating, pumping, repairs and upgrades. Is your system too deep to be dug up by hand? We have a mini excavator on rubber tracks that can do the work of locating the system. This excavator minimizes damage to your lawn and driveway. If you're not sure where your system is we have a electronic locator for finding the system with as little excavation as possible. You can also provide your own engineer to inspect the system and we'll do the earthwork. Contact us to schedule an inspection. Need your Septic system repaired? We can fix any broken pipes, install baffells, risers or replace the tank. Contact us to discuss a repair. As a rule of thumb Septic Tanks should be pumped every three years. If you do not know where your septic tank is Karl's Site Work can locate the tank with an electronic pipe locator. To help offset the cost of pumping, you can also choose to uncover your own tank, or if you prefer, we can send someone out to uncover and cover the tank. Keep a map of your septic system. Keep in mind where your septic system components are. Never plant a tree close to your septic system. Never drive on your septic system unless it is designed to be driven on. Always use liquid soaps or detergents. Studies have shown that liquid soap does less to plug up a system than powdered soaps. Never pour grease, oil or chemicals down your kitchen drain. Do not use your garbage disposal, or if you do have your tank pumped more often. Good practices of conserving water and installing water conserving devices help to add life to your septic system. We've been pumping and servicing septic systems for over 55 years. We are fully permitted and licensed. If you'd like to schedule a pump job, email us. Is your system backing up right now? Please call - don't email!